I ran into this book when I was looking into the Pictish symbols. I bought and read it in Scotland. The title is promising. 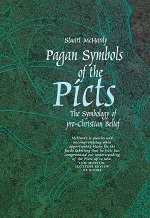 McHardy is a Scotsman himself and wrote several books about the Picts. While reading the book, I get the idea that he is an’interested layman’ rather than a ‘specialist’. McHardy’s book has pros and cons. What is good about the book is that McHardy dares to defy some of the standard scholarly hypotheses. It still seems as if everybody thinks that peoples can be told about by looking at the language they spoke, but things are not that easy. Take the discussion about Celts and Germans in my own country (Netherlands), the same goes for ancient Scotland. There lived Gaelic, Pict and Norse people, all similar, but different and probably there was a lot of contact between the different groups, marriages even. It it too simple to just talk about Celts and Picts. Then there is the leading idea that the Picts came from Ireland, but the author suggests that the Picts are actually the indigenous people of a part of what is nowadays Scotland, or perhaps they were (partly) immigrants from Scandinavia. In any case, they suddenly ‘disappeared’, suggesting that they merged with the (incomming) Gaelic peoples. Having said that, the author takes another route to interpret the Pictish stones than what I read thus far. He sets out to search for the pagan religion of the Picts and see the stones in that perspective. In that search, McHardy looks around in Welsh, Irish, broader Celtic, Scandinavian, etc. mythology to find meanings for the symbols. What is good about this approach is that he looks at every symbol and does not (like other authors, including myself) leave out the animals and hunting scenes. On the other hand, the author goes at length explaining symbols that are hardly found, but about which he found a lot of information. Also the book contains too many easy conclusions. New (to me), but not worked out very well is the suggestion that many of the animals (especially those when there is only a head) are animal disguises. Had McHardy combined this with the notion that Picts are called Picts (by the Romans) because they painted their bodies, there would have been an easy bridge to Männerbünde which in that regard may suggest a direction for the enigmatic geometrical symbols. What I do like in this book, is that McHardy does not look at Pictish art as a separate phenomenon, rather a continuation of what was already present. The double discs could be linked with the prehistoric rock carvings of spirals (for which the author has an interesting explanation). Then again, with his purely ‘religious’ approach, McHardy has no sight for ‘mystery’ and thus the Z-rod is a lightning bolt for example. His suggestion for the ‘crescent and V-rod’ is interesting though: the three phases of the moon, since the crescent-moon is divided in three parts by the V-rod. So, perhaps not a great book with the ultimate answers, but certainly a few paths to think along further.